THIS IS THE OLDER VERSION OF THIS LIST. THE INFORMATION IS MOSTLY STILL GOOD, BUT CHECK OUT THIS LIST OF MY MOST CURRENT LIST OF OFF CAMERA FLASH PHOTOGRAPHY GEAR RECOMMENDATIONS. It is a shame that most photographers stay away from off-camera flash simply because they do not know what to buy and how to get it cheap. This page will walk you through the steps of purchasing a complete lighting set-up for under $150. Note that prices are in U.S. dollars as I found them online today. Pricing will vary according to country, but you should be able to find equivalent products no matter where you live. If you just want my recommendations on gear, I split them up into three packages that you can choose between depending on your budget. If all you're looking for is my recommendation of what off-camera flash gear to buy, then that's all you'll need; however, I wrote a detailed description below the shopping lists to explain all about each piece of gear, how it is used, and why I recommend each product over the competition. If you need more information, it's all there. 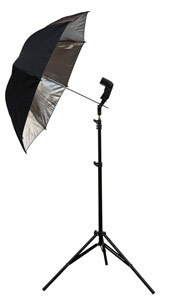 There are two basic types of flash units, or strobes, available. The first type is a monolight, which you'll occasionally hear people call a studio strobe. Name brand monolights are quite expensive and often cost around $1,000. 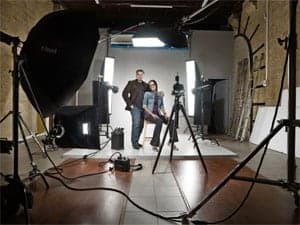 They are also less portable because they need to be plugged into an AC socket and are heavy; however, monolights are preferable for many studio uses because they recycle almost instantly and can output more light per flash. Personally, I rarely use studio strobes. It is too cumbersome and I can usually get away with the lighter (and cheaper!) flashes. The other type of flash is called a speedlight. A speedlight is the small type of flash that can mount on the hot shoe of your camera. It used to be that these flashes were ONLY used on-camera, but in the last few years, the strobist movement has taken over and more and more photographers are using speedlights as a replacement for bulky and expensive monolights. So, you want to buy a speedlight? You will likely change your mind if you go to the camera store and see the $500 price tag on just one Canon or Nikon speedlight. Unless you are a doctor, lawyer, or money launderer, that will likely be outside your budget–especially when you consider the fact that you will want more than one flash eventually. The good news is that third party manufacturers produce fantastic flash units for a fraction of the price. There are many third-party speedlights to choose from, but I personally have found the YN-560 flash to be the cream of the crop for the price. It is powerful, easy to use, and recycles quickly. However, there are two main features that the Canon and Nikon brand flashes have that you won't find on the YN-560: high speed sync and ETTL. Read this article to understand high speed sync. ETTL is a technology that allows the camera to pass exposure information to the flash so the flash can automatically set the power output for you. That is a handy feature for shooting wedding receptions or other areas where the lighting is not consistent from one shot to the next, but I prefer to shoot manual flash anyway for 95% of my flash photography. Manual flash simply means that you set the power of the flash for each shot. It's simpler and helps you to learn more quickly. Triggering a flash off-camera does not need to be difficult. If you don't want to fight with your camera or bang your head against the wall trying to understand this stuff, simply buy the flash triggers that I recommended in the shopping lists above. All you'll need to do is put the flash trigger on your camera, put the flash receiver under your flash, and take a picture. Done! No special camera settings are necessary. It just… works! If you are a glutton for punishment or you have no girlfriend and thus need some frustration in your life, then there are two more ways to wirelessly trigger an off-camera flash. The first way only really works if you have a flash from the same company as your camera. 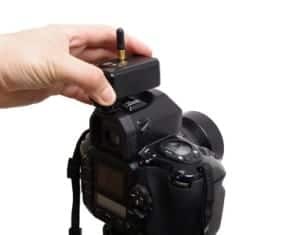 If you bought the expensive name-brand flash, then some DSLR cameras will be able to trigger the flash without the need of a dedicated flash trigger. Note that I said only some cameras do this. Most Nikon DSLRs have this capability built-in. Some newer Canon DSLRs can also do this (Canon 60D and Canon T3i, for example). If you choose this method, you'll have to consult your camera manual and get into the settings and stuff to get it to go. If you are technically inclined, this is pretty simple. If you're already a bit intimidated by this article, then just spend $20 on the flash trigger I recommended in the kits above and you'll sleep more soundly at night. The other way to wirelessly fire a flash off camera is actually useful even if you do buy a dedicated trigger. This method is slave mode. Turning your flash (both the name brand flashes and the YN-560 flash have this capability) to slave mode will tell the flash to fire as soon as it sees a burst of light from another flash. This is useful if you have multiple flashes and only one trigger/receiver. Just trigger the one flash and set the other flash to slave mode. The slave will go off as soon as it sees the light from the other flash. Works like a charm! All a light stand has to do is hold a flash. That's it. However, it may be worth spending a little more money to buy a nicer stand, because the cheap ones don't have a very wide base and are prone to tipping over in even the slightest breeze and smashing your flash and umbrella to bits. Curse words are likely to follow. Not only are the slightly more expensive stands sturdier at the base, they also are generally taller so you can use high angles. The last main feature you'll find in nicer stands is that they are air or spring cushioned. Like the legs on a tripod, your light stand will have two sections that you can extend. If you release the lock on the legs and don't have a firm grip, your flash comes crashing down and slams into position. More curse words. Since the nicer stands are only about $20 cheaper than the stand I mentioned in the “bare bones” set-up, I think spending a couple extra bucks will be worth it. 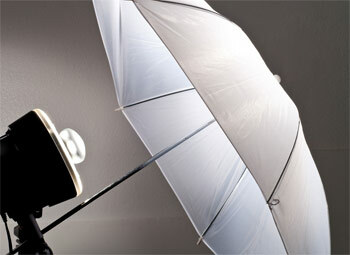 Softboxes, umbrellas, and beauty dishes are all examples of light modifiers. All they do is soften and direct the light from the flash. I know you're going to buy a softbox no matter what I say (because, frankly, they look cooler than umbrellas), but if you actually want to know the difference, then read this article explaining the difference between umbrellas, softboxes, and beauty dishes.